The species is distributed in the Caucasus, Transcaucasia, Asia Minor, Greece and Middle East. Armenia is inhabited by P. m. ponticus Reverdin, 1914. In the country the species has patchy distribution in Central and Southern regions of Armenia. The species demonstrates some adaptability towards habitat conditions and can inhabit dry semi-deserts at about 800 m a.s.l., as well as wet meadows at about 2,200 m a.s.l. The host plants of the Aegean Skipper in Armenia vary, thus Potentilla recta, Agrimonia eupatoria, and Fragaria spp. have been recorded. 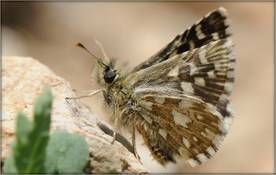 The species gives one generation per annum, at the lower elevations the butterflies are on wing from late April till late May, while at the higher elevation the flight period starts in late May and finishes in late June. At the greater Caucasus some second generation butterflies have been recorded in August, but in Armenia there are no any evidence. The species is usually rare within typical habitat, although in some parts of its distribution the Aegean Skipper has slightly higher density. While it is hard to judge the population trend of such rarely occurring species, the populations of higher elevation range seem to be stable (p>0.05). Probably the polyphagous behavior of the species supports its adaptability under conditions of intensive grazing and mowing. It is also possible that early spring cycle allows species' hibernation before the seasonal pressure begins. The species is not included in the Global, European, and National Red Lists, as well as in Appendices of CITES and Bern Conventions. Preliminary assessment of the species conservation status for Armenia suggests it as a Least Concern. The distribution range of the species is partly covered by Khosrov Forest Nature Reserve, Lake Sevan National Park, Zangezur Biosphere Complex, and Gnishik Protected Landscape. Although, there are no urgent needs to develop conservation measures for the species protection, but it is important to continue its annual monitoring aimed at tracking newly emerging threats.